Finally a new tutorial for all my great followers. Never fear, I will have another giveaway later this month, but I'm sure you will like this. I made this bracelet to go with the Leather Fringe Necklace. You can find the tutorial for the necklace also on this site. Great way to use up left over beads or orphan beads. 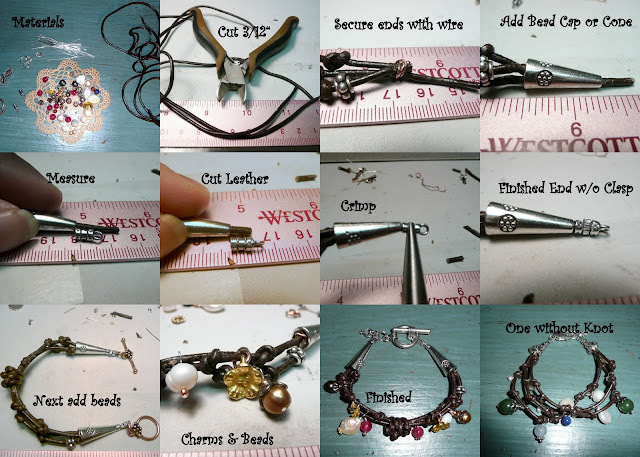 I mixed some of my metals on my second bracelet which is the one pictured in the tutorial. As this bracelet was too long after I had finished the second end I had to tie a knot in the middle to take up slack. I think it turned out pretty good. The last picture is my first attempt and I like it also. Feel free to modify or change it up to whatever you find attractive. This design would also make a great necklace. 1. Cut leather in 3 equal 12” sections. 2. Line up your ends and at ½” – ¾” tightly wrap wire to secure all three pieces of leather. 3. Cut 2 of the pieces close to the wire wrap leaving one long that will go through the cone. 4. Add the cone bead. 5. Measure out your bead crimp and cut the extra off. 6. Insert leather into the end of the bead crimp. 7. Crimp bead tight with pliers to secure. 8. Add one end of your clasp using the jump ring if needed. 9. Start tying knots at various intervals on all three cords. 10. Measure around your wrist to size from time to time. I stopped when it was 8”. 11. Line up the 3 pieces of leather making sure they are equal length. 12. Wrap wire about ½” to ¾” away from the end to secure all three together. 13. Finish this end the same way you did the first end. In between each knot on each leather cord add a bead or charm. If you find that your bracelet is too big try tying a knot in the middle of the bracelet before adding the beads. If bracelet is too small, tighten each knot a little more. Enjoy your cool new bracelet.